Waterhog Geometric Tiles has a 50% thicker face weight than the Waterhog Classic Tiles, which makes it ideal for use in the most demanding applications. 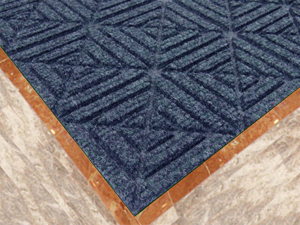 The Geometric Tiles have a unique contoured design that attacks dirt, grime and moisture at multiple angles trapping debris at the shoe level. • Rubber-reinforced face nubs will not flatten under demanding conditions maintaining high quality and durability. When wet, water wicks to the bottom allowing for a safe, slip-resistant surface. • Waterhog tile floor mats are easy to clean by simply using extraction cleaning methods, vacuuming or just hosing off and hanging dry. • Damaged or worn tiles can be replaced easily.